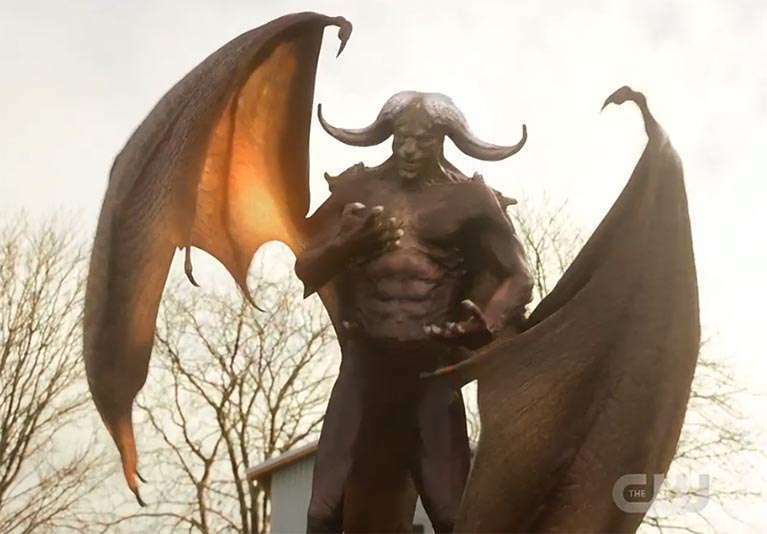 'Legends of Tomorrow': Mallus' True Form Revealed in "Guest Starring John Noble"
Tonight, was the penultimate episode of Legends of Tomorrow's third season, but even as it set up for next week's season finale the show packed in one shocking reveal. Spoilers for tonight's episode of Legends of Tomorrow, "Guest Starring John Noble", below. In tonight's episode, the Legends realized that they were running out of time to stop Mallus from escaping his temporal prison. With Amaya (Maisie Richardson-Sellers) attempting to prevent the destruction of her village in 1992, and Gorilla Grodd attempting to kill a young Barack Obama, the demon possessing Nora Darhk (Courtney Ford) is about to be free. However, Damien Darhk (Neal McDonough) realizes that Mallus' freedom comes at the price of Nora's life, and finds himself having second thoughts. He goes to the Legends for help stopping Mallus before he can take Nora. However, things are never quite that simple on Legends, and Damien's heroic turn is somewhat too good to be true. After being given the Death Totem by Sara (Caity Lotz) as part of a plan to allow the anachronism of a non-destroyed Zambesi happen so Mallus can be freed and then killed, Damien decides his only shot is to keep Mallus imprisoned. He double-crosses the Legends by unleashing Grodd on Zambesi. However, thanks to the Legends, Zambesi does not get destroyed. The anachronism is enough to free Mallus, and that's when both the Legends and views see his true form. No, Mallus is not a giant Beebo. He's far, far more fearsome. Unfurling from what was once Nora Darhk, the real Mallus is a horned, winged, downright terrifying biblical-looking demonic creature straight out of a horror movie. Even the Legends stand watching in horror. What Mallus would look like once freed is something that audiences have wondered most of this season. Voiced by John Noble (who appeared as himself this episode), we've known for some time that the season's ultimate bad would be a completely CG character. Executive producer Marc Guggenheim told Entertainment Weekly this interesting tidbit earlier this year, but finally seeing the terrifying demon makes good on Guggenheim's assertion that the character's final form would be "really cool". "You won't see him in the flesh immediately," Guggenheim said. "We're saving it toward the end of the year. He will be a fully CG character. The design of him is really cool. We're really pushing the envelope in terms of what we can do with the visual effects on the show." Now that we've seen Mallus' true form, though, there’s not time to stand back and admire or be terrified by him. With Mallus free of his temporal prison the demon is now able to wreak havoc on the world. This is particularly problematic because, as Nora told her father earlier in the episode, Mallus would erase history. That certainly can't be good so now it's up to the Legends to save history yet again. Legends of Tomorrow airs Mondays at 8/7c on The CW. The season three finale, "The Good, The Bad, and The Cuddly" airs April 9th. What do you think about Mallus' true form? Sound off in the comments below!